With COOLPIX P610 and its ultra-powerful 60x optical zoom lens, high-end grip-style design, GPS, built-in Wi-Fi® and Near Field Communication technology (NFC)**, plus Full HD video capabilities, a whole new world of shooting and sharing opportunities opens before you. Flip out the swiveling Vari-angle display, hold the COOLPIX P610 overhead and zoom in for an amazing close-up at concerts. Then pull out your compatible smartphone and see the shot you just took with the COOLPIX P610, right in the palm of your hand. Quickly post it to your favorite site and watch the likes roll in. When you're traveling, built-in GPS records the coordinates of each shot you take. And for those who want creative control, the COOLPIX P610 offers full manual control and advanced shooting modes. (For those who don't, it offers wonderful point-and-shoot ease.) Start sharing photos and videos that amaze. Zoom way (way) in with the power of the COOLPIX P610's 60x optical zoom NIKKOR ED glass super telephoto lens and capture close-ups of distant subjects. In the cases that you can't get close enough, utilize Dynamic Fine Zoom, an enhanced digital zoom function that effectively doubles your reach to a whopping 120x zoom! And you can forget about blurry photos and shaky videos—5.0 stops* Dual Detect Optical VR improves VR performance using enhanced detection accuracy to help keep your photos sharp and your videos steady. Quickly and easily send photos wirelessly from your Wi-Fi & NFC enabled COOLPIX P610 to a compatible smartphone or tablet± using the Wireless Mobile Utility app. Share your great photos on the go, even in remote locations, or use a smartphone or tablet to control your camera. The COOLPIX P610 gives you two ways to frame your shots: a swiveling Vari-angle LCD and a high-resolution eye-level viewfinder (EVF). Flip out the large Vari-angle display and capture photos and videos from creative perspectives—overhead, down low or just comfortably in front of you. Put the COOLPIX P610 to your eye and the EVF automatically turns on and displays a beautiful and accurate high-resolution view. Relive the excitement of your travels in a whole new way. The COOLPIX P610 records the exact location of each shot you take, so you can follow the path of your adventure and every stunning view along the way! Share your journeys on Google Maps™, Google+™, and other social networking sites, or with Nikon View NX2 software. Points of Interest (POI) show you nearby photo-ops like scenic lookouts and historic landmarks. The COOLPIX P610 is the ultimate travel companion! Unleash your creativity with the COOLPIX P610. Turn on Moon Mode, zoom in with the power of a 60x optical zoom and capture stunning detailed images of the moon. Highlight a single color in a black & white photo. Create portraits that look like paintings and illustrations using filter effects. Combine multiple exposures into one high-dynamic range image and so much more—all right in the camera. When you want to take control of exposure, the COOLPIX P610 is ready. Select from P/S/A/M exposure modes and the creative options will seem endless. 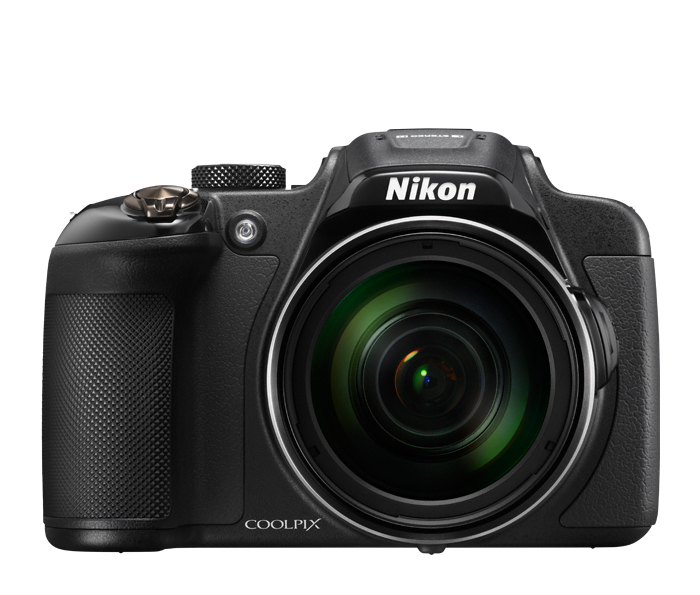 The COOLPIX P610 is powered by an included EN-EL23 battery that charges quickly and delivers up to 360 shots per charge. Buy a second battery, and you can always have a fully charged back-up in your bag. It's frustrating when a smartphone camera focuses on the wrong thing. With the COOLPIX P610, Target Finding AF quickly determines your intended subject and puts the focus where it belongs—on your subject. Record phenomenal Full HD 1080p videos with stereo sound. Connect to an HDTV* and watch your videos come alive. This camera’s built-in Wi-Fi® capability can only be used with a compatible iPhone®, iPad®, and/or iPod touch® or smart devices running on the Android™ operating system. The Wireless Mobile Utility application must be installed on the device before it can be used with this camera. Apple, the Apple logo, iPhone, iPad and iPod touch are trademarks of Apple Inc., registered in the U.S. and other countries. App Store is a service mark of Apple Inc.
Wi-Fi® and the Wi-Fi Certified logo are registered trademarks of the Wi-Fi Alliance. All Nikon trademarks are trademarks of Nikon Corporation. Google+ and Google Maps are trademarks of Google Inc. Dynamic Fine Zoom magnification is calculated from the full-wide end of optical zoom. This camera's built in NFC function can only be used with smart devices running on the Android™ operating system version 4.0 or later. The Nikon Wireless Mobility Utility application must be installed on the device before it can be used with this camera. The N Mark is a trademark or registered trademark of NFC Forum, Inc. in the United States and in other countries. *Based on Camera and Imaging Products Association (CIPA) standards for measuring the life of camera batteries. Measured at 23(-/+2)°C (73(-/+4)°F); zoom adjusted with each shot, flash fired with every other shot, image quality set to Normal, image size set to 4608 x 3456 (16M). Battery life may vary depending on shooting interval and length of time menus and images are displayed.